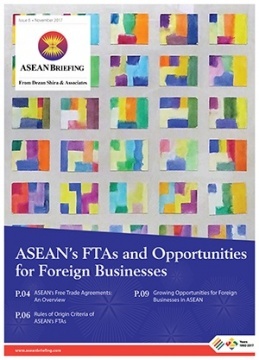 In this issue of ASEAN Briefing magazine, we provide an introduction to some of ASEAN’s FTAs and how foreign investors and exporters can maximize opportunities in this dynamic region. We begin by discussing the salient features of each FTA and the overall benefits they offer. We then discuss the Rules of Origin criteria associated with each FTA that foreign businesses need to be aware of. Finally, we analyze the growing opportunities for investors looking to set up alternative production bases within ASEAN. With a combined GDP of US$2.5 trillion (2016) and a population of some 625 million people, the Association of Southeast Asian Nations (ASEAN) is one of the world’s most dynamic and rapidly developing economic regions. While ASEAN’s rising 150 million-strong middle class offers foreign businesses a significant consumer market in its own right, the regional grouping is also party to several Free Trade Agreements (FTAs), including with China, India, Japan, South Korea, Australia and New Zealand. Further, ASEAN nations have largely abolished import and export duties on items traded between them, allowing free flow of goods between all member states. This combination of a single ASEAN market and its several FTAs are radically altering the global supply chain and manufacturing landscape. Once the tariff reduction schedules of these FTAs are completed, ASEAN will offer close to zero import-export tariffs for much of emerging Asia, including the giant markets of China and India, possessing some 500 million middle class consumers between them. ASEAN therefore represents a massive trade bloc possessing FTAs of global strategic importance.